Work-related back pain and back injuries is one of the most common reasons for people to take time off work or apply for worker’s compensation. This is especially true for people who work in industries that require a lot of physical labor, such as landscaping, construction, and automotive repair, but it can also occur in an office-setting. Here are a few ways to help you prevent these types of injuries. One of the most common reasons for work-related back injuries is simply improper lifting. When lifting, make sure that you are using your leg muscles to bend and lift, instead of your back. Bend your knees to stoop down and grab items that are on the floor – especially heavy items – and tighten up your abdominal muscles. 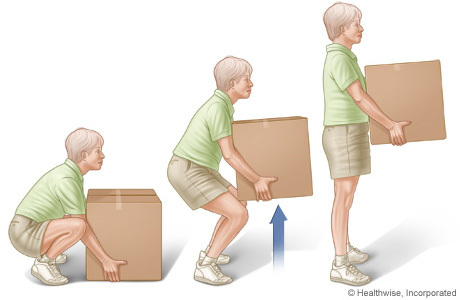 Then, using your leg muscles, lift the item off of the floor to place it where you need it. If you are unable to lift the object alone in this way, ask someone to help you. Twisting at the hips, especially while carrying a heavy object, adds more stress to your lower back region. Instead of twisting, fully turn your body toward the direction that you need to place the object in order to reduce this stress. If you can’t avoid repetition completely, try modifying your routine. Spend a few minutes doing one task that demands a lot of physical repetition, then change to something less demanding. Alternating your tasks like this will give your back and body time to rest after strenuous physical actions. Slouching, whether while standing or sitting, is one of the worst habits to fall into. Slouching puts unnecessary strain on your lower back, and this strain will eventually lead to weakened back muscles and back pain. While standing, make sure your shoulders are back, and your body weight is evenly distributed on your feet. If you need to stand for an extended amount of time, consider purchasing a fatigue mat, especially if you’re standing on a concrete floor or other hard surface. If your work mostly revolves around the computer, make sure that you’re practicing proper sitting posture, and that your monitor and keyboard are properly positioned. Also, men should try to remember to remove their wallets and cell phones from their back pocket to reduce the stress on the lower back and hip areas while sitting. Additionally, if you use the phone a lot, consider purchasing a headset to reduce or eliminate the need to tilt your head in an awkward position to hold the receiver between your head and shoulder. According to the Department of Health and Human Services, adults should maintain a healthy weight in order to reduce the risk of developing back pain. Approximately 150 minutes per week of moderate aerobic exercise, or 75 minutes per week of vigorous aerobic exercise, as well as some strength training exercises conducted at least twice week should be enough to help you maintain a healthy weight. To achieve this, consider walking or swimming every day, and lunches or hip bridge exercises twice a week. There are also several stretches that you can do daily that will help reduce the pain and strengthen your back muscles. Many jobs today require frequent heavy lifting, even the cashier at the grocery store. Try to minimize the amount of time that you spend carrying and lifting heavy objects, including shopping bags, briefcases, suitcases, and purses to help reduce the risk of developing back problems. If this is unavoidable, consider purchasing things that include wheels, such as rolling suitcases and using the shopping cart to carry your purse while browsing at the store, as well as using the shopping card to carry those bags to your car. If you’ve been lifting or carrying heavy items for a prolonged period of time, or if you’ve sat still for too long, your body will eventually tell you when it’s tired and needs a break. When you begin to feel your muscles feeling tense and tired, give them a break! Take a few minutes to yourself every hour to stretch your muscles, or change positions. This will also allow for better blood flow. It’s no fun dealing with back pain. Millions of people suffer from back pain, and in the majority of these cases it is due to work-related issues. By following these simple steps, you can stop work-related back pain before it even starts!